I'm blaming my own lack of awareness on both the excessively cool spring we've had and still being in a bit of a baby-induced fog. But is it just me, or did the summer totally sneak up on us this year? I didn't even realize it was Memorial Day weekend until the Thursday before when someone asked our plans for the long weekend. And now we're suddenly almost halfway through June?? Caroline is starting kindergarten in August, and Smith will be starting preschool in September. Time needs to slow down juuuust a little, because before I know it the twins will be graduating from high school! But now that I'm firmly in summer-mode, I'm taking full advantage of the warm weather - dinner is cooked on the grill almost every night, and we've been eating on the screen porch nightly as well. The kids just love being out there - Caroline gets super excited when I start carrying things out to the porch for dinner. These burgers were one of our first al fresco dinners of the season. 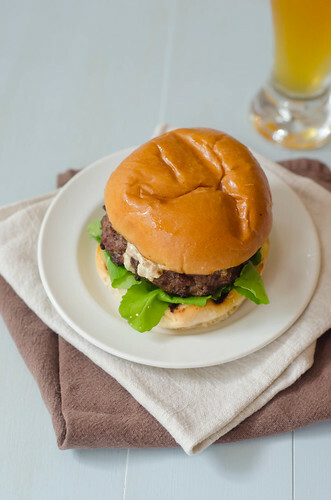 It's a basic burger, but its kicked up a notch by stuffing it with a blue cheese filling. The filling is a mixture of blue cheese, cream cheese, shallots, garlic, and mustard. And it's goooood. The rich and creamy filling pairs just swimmingly with the juicy burgers. I couldn't get enough. They come together quite quickly - the filling is mixed up, the burger patties formed, and then they are chilled for a bit before grilling. This allows the cheese to firm up, thereby keeping the stuffing inside the patties versus oozing out all over the place. It also provides you with a great make-ahead dinner. I actually prepped the burgers early in the afternoon, and then when it was time to eat, just threw them on the grill while I cooked the sides (green salad and grilled corn on the cob, by the way). We all absolutely loved these burgers, and I know they'll make many repeat appearances on our (outside) dinner table this summer. If you're planning to grill out for Father's Day, these would be a great option - a little fancier than your everyday burger, but well -- it's still a burger. And who wouldn't love a burger stuffed with cheese? Stir together the cream cheese, blue cheese, onion, mustard, garlic, and a pinch of salt and pepper. In a large bowl, gently combine the ground beef with 1/2 teaspoon of kosher salt and 1/2 teaspoon of pepper. Shape the mixture into 8 (4-inch) patties and arrange in a single layer on a foil-lined baking sheet. Spoon 1/4 of the cheese mixture onto each of 4 of the patties. Top with the remaining 4 patties, pressing and pinching the edges to seal. Cover with plastic wrap and chill for at least 30 minutes, or up to several hours. To grill the burgers, prepare the grill to medium-high heat (350 to 400 degrees Farenheit. Brush the grates with oil and grill the patties 6 to 7 minutes per side, flipping once. Serve on toasted buns with your choice of accompaniments. I loved this simply with arugula - the burgers were juicy, and the stuffing provided plenty of flavor without the need for additional condiments. I made blue cheese stuffed burgers once back when I still ate meat and it was such a fun way to spruce them up! yay for dinners outdoors...those are the best! through on a monthly basis payday loan in california thus financial institutions are playing with spread, which will make old customers feel cheated. Mmm I love stuffed burgers! Josie!! I adore blue cheese with beef! The idea of mixing the stuffing with soft cream cheese, mustard and shallots is genius. I can't wait to try this recipe. Thanks so much! Nice article. Thanks a lot. It looks pretty tasty.